Rustic Perfection - finding the right balance! Growing up in a blue collar family, I noticed how my father was a master at saving money and coming up with creative ideas and solutions to different problems. One of his favorite sayings was “A fool and his money soon part”. Now, that I am a grown man of 64, I see that these values he instilled in me also permeate my life as well. Over the years of working with barns, barn homes and colonial restorations, I have always seen this work through the eyes of a frugal man, and have always sought to find ways to achieve a beautiful look in the most cost effective way. I have tried to find the optimum balance between aesthetics and money, and to come up with what Consumer Reports calls a “Best Buy”. Many of these strategies, particularly recycling old woods, are at the heart of what is now called “GREEN BUILDING”. We have been building green for decades. Here are a few of the strategies we use in our barn-home and other barn conversion projects in an attempt to give you the most for your dollars. Although it is by no means a complete list, they are some of the most important ones and hopefully will give you a good idea of our philosophy and general style with which we approach our design and building projects. One should select a really exceptional barn frame suited for his home conversion that is the appropriate size and configuration for his specific sq. 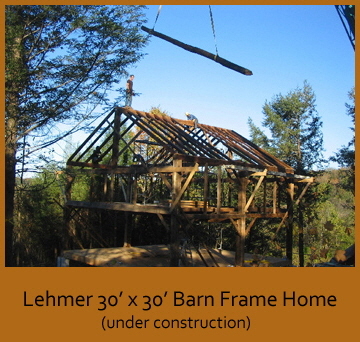 footage needs and projected uses (see “What Makes a Good Barn Frame”). All barn frames are not alike! If you are going to invest your money and heart into building a barn home, you want to use an exceptional barn frame- not just an average one- as all your costs are basically going to be the same. 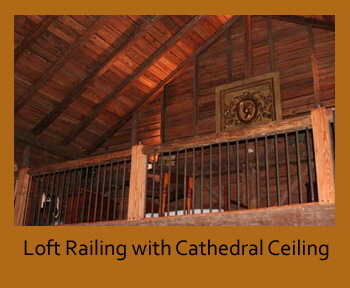 In fact, starting with a bad or inadequate frame will probably increase your costs significantly, as you may have to do extensive repairs or structural adaptations to pass engineering standards, cut out or move tie beams or install dormers for head room on your second floors or lofts, or perhaps even build a new structural roof on top of the rafters because the existing roof system is not meaty enough to pass building codes. There is also a vast difference visually between a really heavily timbered barn frame in good condition and a skimpy one in poor condition. Be sure that your barn frame is in reasonably good condition and has been carefully dismantled, marked, photographed, repaired, and documented so that detailed designs, plans, and architectural drawings can be done for its future use. For reasons explained earlier, one of our preferences is to use a smaller barn frame, and then attach some conventially framed additions at strategic places to get the floor plans and desired sq. footage necessary for your home. However, we also find larger barn frames that are perhaps big enough to give you your desired sq. footage of living space in and of themselves. We also like to use as many recycled woods as possible from other parts of the barn including siding, flooring, grainery wood, roof sheathing, floor joist, and beautifully cut foundation stone. There are many different looks (see "The Many Faces of Antique Woods") that you can achieve with these woods that will blend in wonderfully with the overall theme of the barn home, and they can encompass the entire spectrum from extremely rustic to beautifully finished. Aged white and red oak, hemlock, white pine (pumpkin pine), elm, black ash, native American chestnut, spruce, and long leaf yellow pine are some of the species of wood we regularly recover from our careful dismantles. The design and overall construction drawings for your barn-home are extremely important if you want to build a well thought out conversion in the most cost effective manner. This phase may well make or break the relative success of the entire project, and we feel it is very important to have someone who has had experience with designing and building historic barn frames and experience working with vintage lumbers. Although the antique barn-home-lumber business is not necessarily complicated rocket science, there are many aspects of it that are not obvious or merely common sense to builders or architects with little or no experience in this specific field. 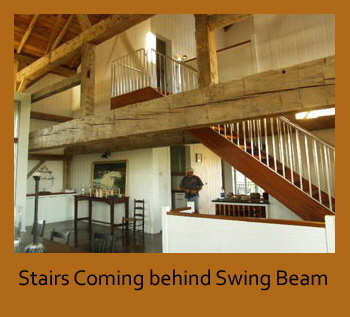 It is important to develop barn conversion plans and architectural drawings that are intelligently conceived. We feel it is essential to attempt to maintain the integrity and timber configuration of the existing barn structure, while at the same time incorporating your living space requirements and, of course, your own individual desires and tastes. We believe that the more your home can be expressed within the given structure of the barn frame as it exists, the less money you will spend, and the more natural and harmonious your home will feel in the end. ~ Use maintenance free woods on the exterior for siding and trim, such as weathered cypress. ~ Mix in some new woods (fresh cut) that tend to blend in well with the antique woods and age quickly. ~ On new woods use air dried woods instead of kiln dried. ~ On interior walls and ceilings use 1/2" thick sheathing instead of 1". This cuts lumber requirements and costs almost in half. ~ Over-sand and round the edges of interior woods instead of T&G or ship-lapped. It saves wood and milling costs and gives a great look. ~ Use as many recycled interior components as possible, including doors, kitchen and vanity boxes with new faces. ~ Do all the work and craftsmanship within the parameters of what we call "Responsible Tolerance". ~ Be sure that your over-all project has an organized work site, secure and manage competent subs, and purchase your supplies, miscellaneous hardware, nails etc. in a timely and intelligent way to eliminate as much labor inefficiencies as possible. This can be a real financial killer if not done properly. ~ And last but not least, it is very important that the contractor, subs and suppliers are paid in a timely manner, and a sense of fair play permeates all the business transactions that happen during the job. A paid and respected contractor, worker or sub is a happy one and you will get so much more from a happy one. If you are interested in reading more about these strategies Click Here and/or please feel free to call me and discuss.